An outstanding question regarding the use of UASs for marine mammal surveying and research is to what extent or under what circumstances they may disturb the animals they are observing. Most researchers report that, at the altitudes they fly above marine mammals, there is little if any discernible response by the animals (e.g., Acevedo-Whitehouse et al. 2010, Goebel et al. 2015, Koski et al. 2015, Moreland et al. 2015). John Durban (SWFSC), Michael Moore (WHOI) and colleagues have flown over a thousand VTOL UAS missions in the last few years to photograph humpback, North Atlantic right, killer, gray, sperm and blue whales, and have found no evidence of a behavioral response to the UAV (J. Durban, SWFSC, and M. Moore, WHOI, pers. comm.). Researchers from the SWFSC and Vancouver Aquarium conducted a behavioral- response experiment in which they found no apparent reaction by Northern Resident killer whales to an APH-22 hovering over them as low as 30 ft (J. Durban, H. Fearnbach and L. Barrett- Lennard, unpublished data). Further, these researchers from the SWFSC and WHOI have approached large whales (humpback, North Atlantic right, and blue) to within 3 m to sample EBC, again without any apparent behavioral reaction. 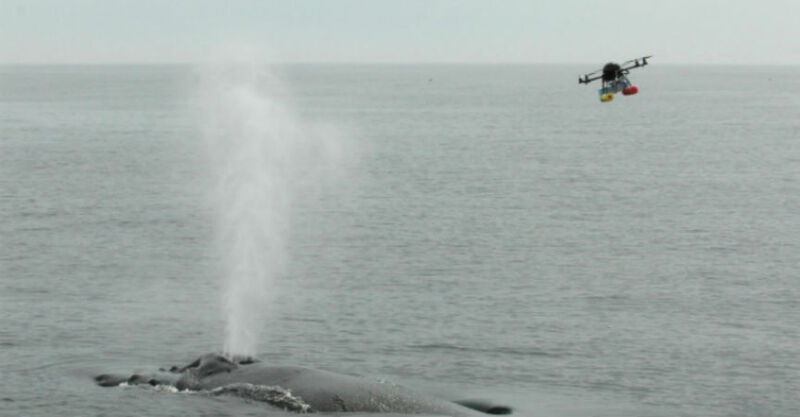 In addition, dive profiles for blue and North Atlantic right whales have shown no change to over-flight by UAVs (Moore et al. in prep). Nonetheless, most studies have not reported data on disturbance rates, and there have been few attempts to systematically assess the factors affecting disturbance (e.g., vertical and lateral distance, UAV type, engine type, sound levels, speed), as recommended in Smith et al. 2016. In one published study of disturbance, Pomeroy et al. 2015 found that reaction of gray and harbour seals depended on the vertical and lateral distances to the VTOL UAV. In some cases in that study, and as reported anecdotally by other pinniped researchers, close approach by a UAV can produce strong reactions, up to and including fleeing. Recently, Sweeney et al. 2016 have begun systematic studies of pinnipeds to assess their behavioral response to the APH-22 at different altitudes and under different conditions, such as site type (haul-out or rookery) and topography, season, weather, ambient noise, and the presence of birds. Habituation would also affect the threshold at which the sound or proximity of the UAS creates disturbance.